Today I'm sharing a project from Lisa Occhipinti, a painter, book artist, Etsy seller, instructor and author based in Venice, CA. 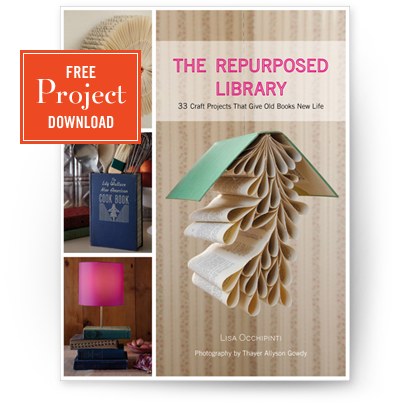 Lisa loves rescuing discarded books and using them in her paintings and projects—including the sewing box project in her new how-to book, The Repurposed Library. The Repurposed Library presents 33 items crafted from books: learn to make wreaths, vases, shelves, storage boxes, and more. If you get a kick out of watching people wield glue guns, check out the book's lovely trailer. To learn how to make a sewing supplies storage box from an old book (choose a sewing book for maximum awesomeness), download the PDF instructions. The file is 1.3 MB, so be patient if it takes a minute. Go make yourself a sandwich and come back. Then keep your eyes peeled for an orphaned book that needs a new lease on life. As an English teacher/lit major, destroying books usually kinda freaks me out - but those look really cool and still preserve some book integrity :) Thanks for sharing! pretty neat idea! i just have to find a nice old hardcover book for this project. I wouldn't. Better that, than have it sit unused on a shelf collecting dust, then thrown away! I have an entire encyclopedia set that is just waiting for this kind of project ... thanks! 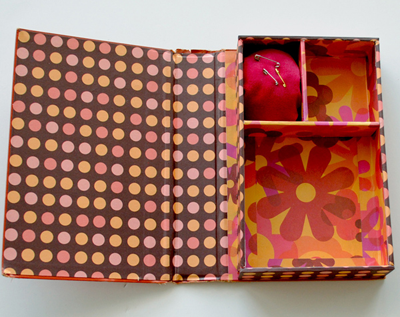 uu, wonderful - and all the possibilities... jewelry boxes! pearls and buttons! fishing lures! lego pieces! spices! I know what to make for Christmas gifts this year :D THANK YOU THANK YOU! Wow! What a great idea! I'm going to search around for book I can use! I agree, such a brilliant project. I have an entire collection of college textbooks 35 years out of date. Now can turn into a craft for our Cub pack. It's hard for me to do that to a book too, but here's a option: Go to a place that resells books, like Half-Price Books. I know that people sometimes bring in books that can't be resold so they are taken to be recycled. I would go in and ask if they had any hardbacks that are in their recycle stack. What another great idea! Thanks for sharing! I am a librarian and I support crafting with old books! This is great!! This is a fabulous project. This is such a cool idea, I know what I'm getting my book loving, crafty sister-in-law for the holidays! Thank you so much for this post. I want to let you know that I posted a link to your blog in CBH Digital Scrapbooking Freebies, under the Page 3 post on Aug. 04, 2011. Thanks again. Oh, I am so very convinced that you are reading my mind. I had an epiphany just yesterday that a new sewing box would make life much easier. Thank you for coming to my rescue! Sounds like a fabulous book -- right up my alley. This project definitely caught my eye too. I'm downloading the PDF and am going through my collection of funky ol' books today. Thank you!! I love this project! It's just what I need for toting sewing projects around with me as I drive kids here and there. I've seen several book boxes in stores for up to $15 - $20 each! This is definitely a better way to get a book box! You could even get a thrifted book and make a book box! Thanks, Nisha! That makes me happy. What a wonderful idea! My daughter just started sewing (and is doing an excellent job!). This would make a perfect Christmas gift for her!A few weeks ago I actually found a copy of the exact sewing book used in the tute at a thrift store for $2! I got another one about needlecrafts that's the same size for $1. Thank you!I Can't wait to get started! 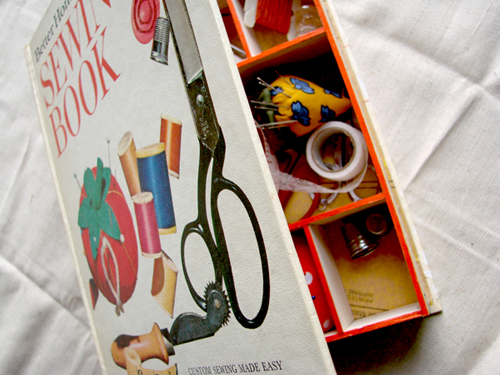 I love the idea of taking an old sewing book that is very out dated and turning it into a sewing box. One could even take an old book and red decorate it and turn it into a jewelry box. Great idea with so many possibilities! I like you sewing box idea, actually I need one. As university libraries are going digital, they are getting rid of a lot of their bound periodicals, journals, etc. I have an enormous stack of books that I couldn't bear to see go to waste. Thanks for the idea & a heads up for all who need to find hard back books for this project. Wanted you to know I posted a link to this tutorial today. I have some really old college textbooks that I've thought about using the pages from for mixed media. This would make use of the rest of the book. The hard part would be finding the right book to use. All libraries (including school libraries) weed out old books regularly. I know in my library, I'm constantly weeding out 50 year old books that somehow weren't noticed the last time through. Be sure to ask -- we weed and ours are recycled. What an AWESOME use of the hardcovers from the knitting books I'm going to take to get transformed into spiral bound vs hard cover! The hard cover has to be removed by the book owner before the copy shop will insert the spiral binding (I want them to stay open to the page I want while i'm knitting!) so now I can use those hard covers to store my small knitting tools. THANK YOU!!!!!!!! I loved your project idea and downloaded the PDF file and read the instructions but have one question. She refers us to page 13in her book on how to remove the book block. I don't have her book and was wondering how to do this. I want to be able to make this project and need to know how to remove the insides of the book.